It was a sight to warm the cockles of one’s heart at the North East Book Fair underway at Chandmari in Guwahati. 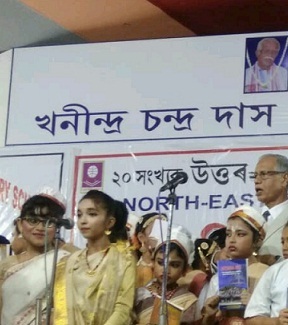 One hundred children released four books on Monday written by educationist and litterateur Basanta Kumar Bhuyan by holding them aloft. The four books were the Assamese and English versions of Managing Life: From Mother’s Womb to Death, For Modern People of the 21st Century and Astanga Niti: The Mantra of a Happy and Meaningful Life. Bhuyan’s books focuses on life skills and life’s lessons and are targeted at juveniles and youths. He discussed both the books and dealt on the topic on how one could interact with family and society in order to build a strong, meaningful life and a healthy society. The books discusses ways in which how one could best achieve a satisfying life, how one could achieve life’s objectives and how the Astanga Niti could help in this regard. Bhuyan said that the 21 books written by him earlier had been well-received and these books should be read by people in today’s age, especially youth, who are confused by the ups and downs of life and the hurdles which they face in this world. The colourful programme ended with children of Gurukul Grammar School singing O Mur Apunar Desh in four languages.